3V Tech assisted its customer and owner of the technology, in navigating the various stages of project to ensure that their plant was designed and built as efficiently and cost effectively as possible. 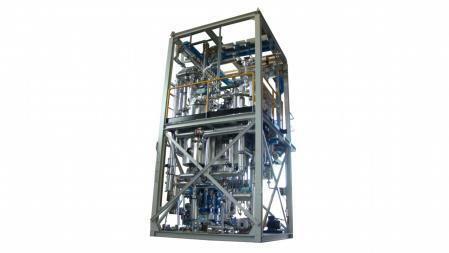 A typical example is the etoxylation pilot plant 3V Tech made for a customer. Ethoxylation is an industrial process in which ethylene oxide is added to alcohols and phenols to turn it into a surfactant. The customer choose to take advantage of 3V Tech's specialized, specific knowledge and experience by involving us early in the design process . 3V Tech's process engineers worked closely with our customer in the early-stage development of the project. Thanks to 3V Tech's multi-disciplined engineers and manufacturing capabilities, detailed design, procurement and fabrication were executed in parallel on a fixed price, lump sum basis. With us customers minimize the risk of cost overruns and allow 3V Tech to optimize its manpower allocation and compress the overall project schedule. Our activities include customer-witnessed factory acceptance tests (FAT) in one of our manufacturing facilities. Following shipping to the customer's site 3V Tech's engineers and technicians provided on-site installation and pre-commissioning support.